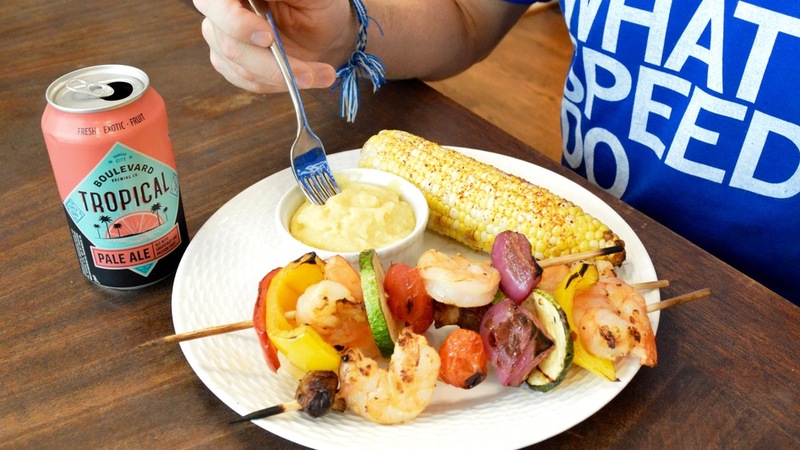 Shrimp Kabobs w/ Corn and Polenta — Happy Food Co.
Ready in 30 Minutes | For the best experience, please skim through the steps before you start cooking. *If the oil has solidified in the fridge, place the sealed container in warm water. It will return to a liquid. SOAK the kabob skewers in a shallow pan of water. REMOVE the tails from the jumbo shrimp. TOSS the shrimp with lemon pepper and chili flakes in a medium bowl. TOSS the veggies with balsamic vinegar and extra virgin olive oil in a separate medium bowl. SKEWER the jumbo shrimp and veggies. ★TIP: You can skewer the proteins and veggies separately to accommodate a vegetarian diet. GRILL (CHEF RECOMMENDED): Arrange the kabobs in rows on the grill. Place the corn on the grill over indirect heat. Grill for about 10 minutes, turning the kabobs and corn to cook on all sides. OVEN: Place the kabobs and corn on a foil-lined baking pan, and bake at 450 degrees for 10 minutes. BOIL the vegetable broth in a medium saucepan over high heat. STIR the polenta into the broth and reduce heat to low. COOK for 2–3 minutes, stirring constantly, until the liquid is absorbed. STIR in 4 butter balls and the grated parmesan. MELT 1 butter ball over each ear of corn and sprinkle with tajin seasoning. SERVE the kabobs and corn with parmesan polenta and an ice-cold brew. Enjoy!